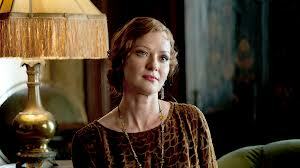 Speaking of TV shows as we were the other day, the show I find I like best is Boardwalk Empire. Not, I suspect, for the usual reasons. I don’t like it because I find Gillian a fascinating character. She ran a house of prostitution but really did seem to insist in maintaining an atmosphere of courtliness there. Think how appalled she was when Lucky Luciano’s men were seen to be taking their pleasure right there in the drawing room. I also don’t like it because of Steve Buscemi with his wildly protruding eyeteeth, though I’m a big fan of those teeth. Without them could he possibly have risen in the world of film? Back in 1990’s in The Usual Suspects they made him seem only laughable. Then in The Sopranos when his character Tony Blundetto was getting out of prison and trying to start his life over as a massage therapist they seemed strangely sweet. Now as the corrupt, icy-eyed puppetmaster Enoch Thompson the teeth make him seem above all petty concerns like vanity. 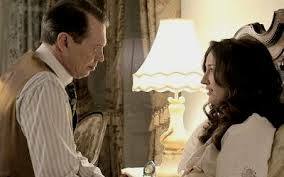 Nucky has his eye on the prize; with his wife and child long dead, nothing else even appears on his radar. The truth is, I like the show for its interiors. I love the rooms in Boardwalk because they look just like the rooms I grew up in. 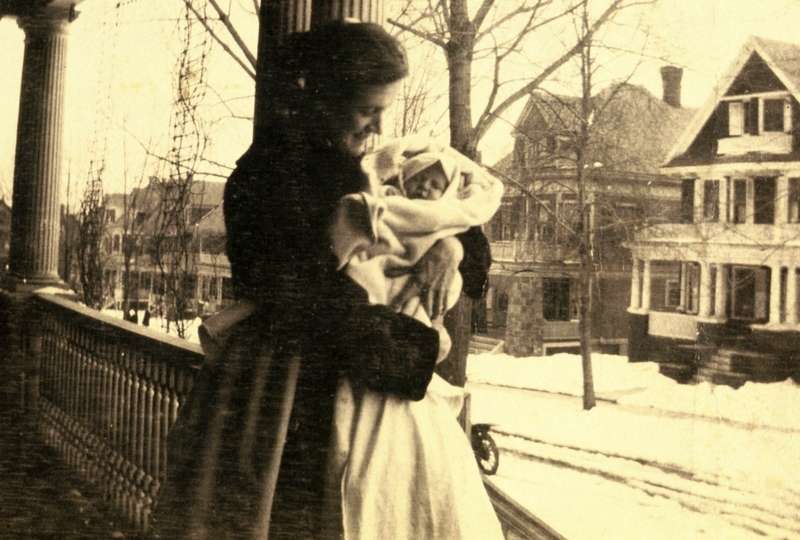 My grandfather purchased our family home for his new wife Grace, three long years after the sudden death of his bride Carrie who was Grace’s loving sister. Carrie had wide cheekbones and electric blue eyes and she died at 31 carrying the couple’s fifth child. This new bride Grace was older when she came to marry my grandfather. She was 30 and a dedicated schoolteacher. She didn’t want to leave her students – she said so in many a letter to this man who was courting her but in 1913 no teacher could stay in the classroom once she had married. He bought this house for that former schoolteacher and his four little children, who were 4 and 5,and 6 and 8. 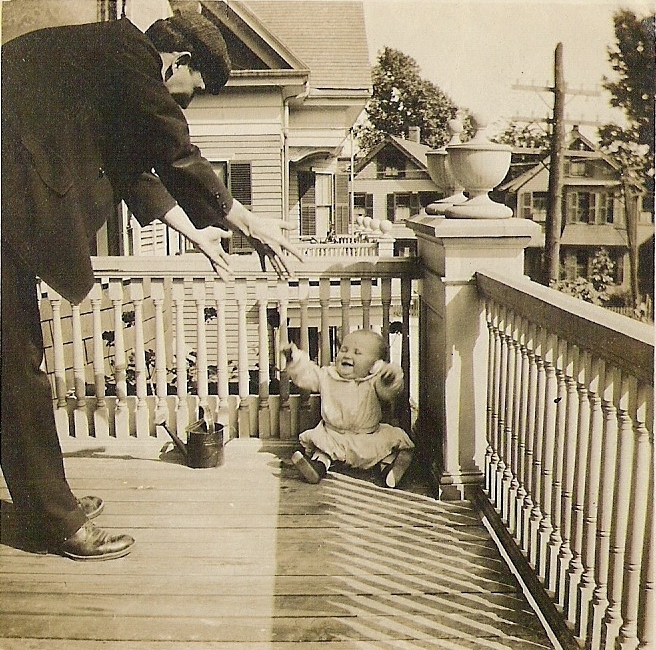 ….and with five little ones together and a house with such a nice front porch life was good. I know because I have read all the diaries. And the house? The house fell under a spell. Thirty-five year later, when I came to live there, with our grandfather an old man by then, and his two ancient sisters-in-law still there and now my big sister Nan and our mom, the place looked exactly the same as it did around 1920, because, as I believe, no one had the heart to redecorate it. And so in some crazy way, when I see the interiors on Boardwalk I think “I’m home!” I think that my gentle grandfather is reading one of his many histories of the Republic in his wing chair, and the two great-aunts are shuffling about, making jam and clucking over the news of the world. Our mom is working from home every day trying to prop up a failing business and Nan and I are happily lowering baskets of stuffed animals suspended by a string of tied-together scarves from the third floor banister clear down to the entry hall so many steps away. 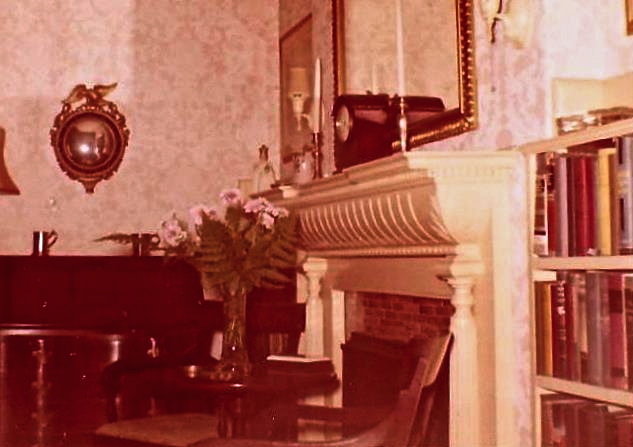 This was the ‘best’ living room as we called it in the late 1950s. Maybe you can see what I mean. Where is the past then? Where are those faces? Washed away now, like the footprints Atlantic City’s Nucky Thompson leaves in the sand just off his boardwalk. And yet I have that circular mirror you see on the wall, and Nan has that desk. I have that little round tip table and my girl Annie has those chairs I even have all the books in the bookcases even, and the very same pink paper on my walls. Everything, in short but those people and how I do miss them. How I do miss them today. Nucky and most of the men are very well dressed. 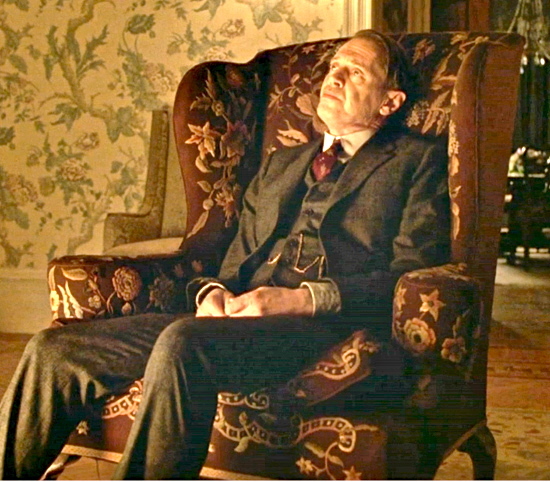 But Nucky is an impeccable dresser. The men’s overcoats of many colors solids and tweeds, cuff links with starched striped shirts with a tab collar (a cross pin). And Chalky is also a very fine dresser. Formal dress for dinner and the women’s dresses and hats are also beautiful. It was a wonderful era to live (provided a person of some wealth) but even the more average folks still showed respect in their dress too. The dramatic opening with Nucky in his two tone wingtip shoes being rinsed by the small waves is great. I remember yearly trips to Atlantic City and my mother and I would ride / race up and down the beach off season. Terry, remember that circular mirror “lies”. This insight came from a most wonderful lady who must worn numerous ruffled blouses, fine hats, and the appropriate broach or cameo pins. If only the mirror could recall what it has reflected. Maybe one’s own imagination is enough to bring soothing thoughts to the heart. God I love talking about this stuff! You are obviously one who appreciates men’s wear..
You know what else I noticed ? In all the ‘still’ images of Nucky as played by Steve B not one shows those troublesome teeth.. Take a look and tell me what you think of that. And thanks for that reminder about mirrors and what they have seen. Ah the past ! Love it, love you, love the Irish you bring into us all. My grandparent’s on both sides lived in houses that sported 20’s era furnishings and décor well into the 60’s, as well. I also recall driving around with them in the very late 50’s in those old 1940 style, blue grey, bubble to top cars, with that big rope along the musty back seat, designed to hold a blanket to ward off the cold. Back then all I thought was…all this stuff is old. Now I realize it was an opportunity to actually live in the past. When you think about it, when we were kids back in the 60’s, the 20’s really weren’t that far removed…at least to the “grown-ups” of the time. To us, the grownups of today, our 70’s are the equivalent of their 20’s. I bet there is still many a house on the street today sporting psychedelic, Laugh-In style, big flowered wallpaper kitchens, “ultra-modern” space age inspired, furniture, with possibly even a shag rug or two, still in place. I think we have the better memories. you know Brian that just occurred to me too! For them the 20s were recent even as the 70s are to us as you say ….. I mean, I still have my platform shoes right? Think about it: the Big War was just seconds before. The earth was still trembling. Thanks for this. write something about those cars for us all!